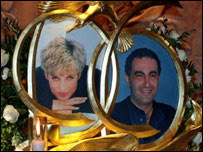 Details of letters written from Princess Diana to Dodi Al Fayed have been revealed at the inquest into the couple's deaths. The princess wrote "with all the love in the world" and of him "bringing such joy" into her life in August, 1997. The letters were produced during the cross-examination of Diana's close friend Rosa Monckton. In one letter Diana described a gift to Mr Al Fayed - cufflinks which belonged to her father. 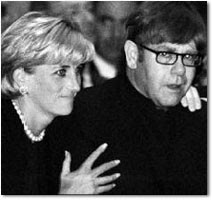 On 13 August 1997 the princess wrote about the gift: "Darling Dodi, these cufflinks were the very last gift that I received from the man I loved most in the world, my father. "They are given to you as I know how much joy it would give him to know they were in such safe and special hands. Fondest love, from Diana." Hvem husker ikke dagen Prinsesse Diana ble begravet - og sangen fra Elton John's sang -"Goodbye England's Rose"